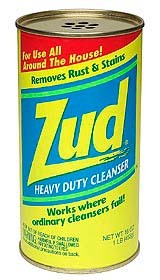 - Eliminates stubborn household stains - Safe on most surfaces For those stubborn household stains that other cleaners just can't get out, it's Zud to the rescue. Makes short work of rust, mineral stains, hard water deposits, and soap scum, yet it's safe to use on copper, brass, bronze, chrome, aluminum, iron, pewter, ceramic, porcelain, and stainless steel. Simply sprinkle it on and rub as needed until the stain vanishes, then rinse and dry. Great for cleaning kitchens, bathrooms, barbecue grills, boats, RVs, and aluminum storm doors. 16 oz. can. Avoid the $4.99 Minumum Charge! Enter zud4all in the coupon code box during checkout.